The Smertest Presdent Evah can count better than you. He can count better than math people. He can count better than Math itself. On a conference call, he told those who managed to actually get in to the call that over 100-million people had signed up for Obamacare. Now, I know you heard reports the number enrolled was only 106,185 ... but that's using Old Math. With Obamamath, it's over 100,000,000. Obamamath also explains how the jobs rate improved suddenly right before the election. There was no fraud involved; it was Obamamath! It also explains how Obama's poll numbers are so high. Obamamath! But -- and here's the good news -- you and I can utilize the new science of Obamamath. When I have to pay my credit card bill, I can write a check for $10 and pay off a $1000 debt. Obamamath! When I sell my car, I can get a lot for it because it gets 5,394 miles per gallon. Obamamath! This Website? It gets 7,327,463 hits ... per hour! Obamamath! And, yes, ladies, I am VERY well-endowed. 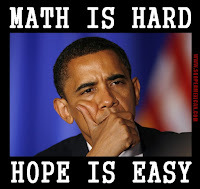 Using Obamamath. 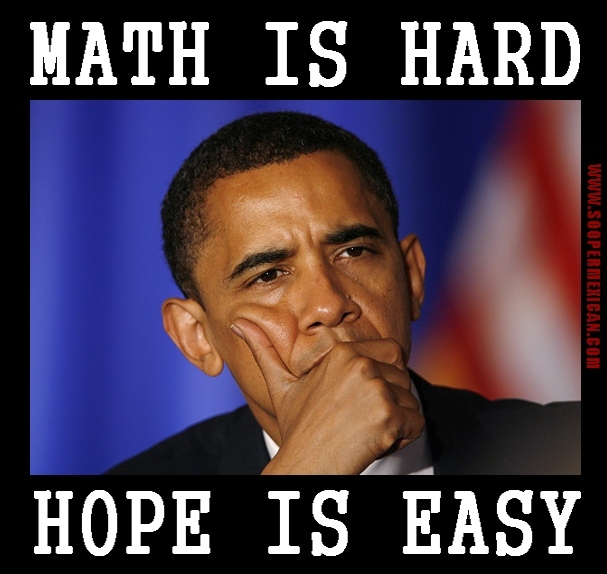 There are new worlds open to us all with Obamamath. Things are so much easier when you make up your own facts. I have to defend Obama here. He's the next logical step on the destruction of the American Experiment in Self Rule. Or rather, he's the next logical step on the ladder of the American Self Fool. People want to believe what they want to believe, so pols have been telling them what they want to hear for a long time. We've had our fine media betters telling the people what they want the people to hear. Now we have a Deer Leader who tells the people what he wants them to hear and his sycophants in Minitrue are more than happy to spread the word while they just let him eat his damn pancakes. It's a brave new world out there, about 29 years late. Clinical name: math and fetter-means. @jw: Thanks! Whew --that's a change I can believe in! Basil, fFor some reason, I want to shorten it to "Obamath." Call it the Leibnitz (numnutz?) notation or some other damn thing. But , but, suppose I didn't like you and wanted your ladies (please don't tell my lady, she doesn't play mind games) and I used Obamamath on you. Couldn't it be proved that you came up short. Just saying that with omath the rules belong to the user.